My mother and I were big fruitcake fans. Maybe it was our Scottish roots. Folks certainly have strong opinions on the subject of fruitcake, don’t they? When I found a version of this recipe in Jeffrey Steingarten’s The Man Who Ate Everything I thought we had a winner. Steingarten, a superb food writer, is known for his in-depth research into every aspect of food and drink imaginable, often delivered so as to make his readers laugh out loud. My mom and I first tried his recipe in 2002 and it took us several Christmases to fine-tune it to our satisfaction. We turned our noses up at “mixed green and red candied pineapple” and headed for our friendly Harry & David store for candied apricots, beautiful glazed cherries and premium dried pineapple. I learned to use best quality unsalted butter. Our first cakes were raw when cooked according to Mr. S’s instructions and other directions cried out for revamping. Here is the recipe that worked for my mother and me. We made our last fruitcake together in 2006 with a note next to our recipe to “Try adding dates in 2007?” By then, sadly, I had lost her to cancer over Thanksgiving. After three years, it’s time to make our fruitcake again, Mama. 2. 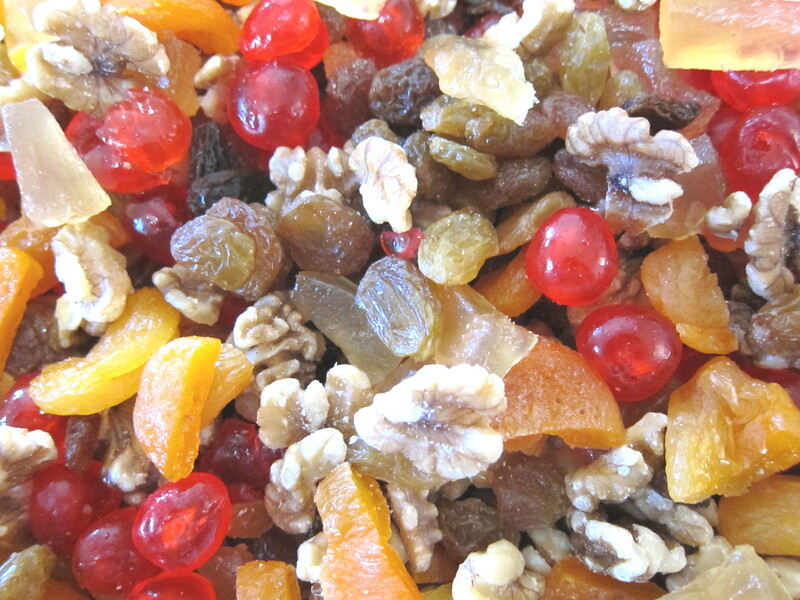 Rinse the candied cherries and combine in a very large bowl with all the dried fruits and walnuts. 3. Using a stand mixer with a paddle attachment, beat the butter until light. Add the sugar and mix well until fluffy. 4. Add 3 of the eggs to mixture, then 2 cups of flour. Mix well. Add last 3 eggs and final 2 cups of flour. Mix well. 5. Add the lemon extract, zest, lemon juice and vanilla to cake batter and combine. 6. Pour cake batter over fruit and nuts. Use a sturdy hand spatula to thoroughly combine ingredients. Batter will be very stiff! 7. Butter loaf pans and line with parchment paper. Lay one piece lengthwise, another crosswise. Trim to fit pans. Butter fitted parchment paper. 8. Pour batter into pans, leaving one half inch of space at the top of each pan. 9. Cover pans with foil and bake for 45 minutes. Remove foil and bake, uncovered, for 60 minutes. Cakes should pull away from sides of pan and resist pressure from the touch of fingertips. 10. Cool in pans on rack. Unmold, remove paper, wrap in plastic wrap and chill. 11. Try to wait a few days before tasting, something my mother and I could never wait to do. You may refrigerate this cake for at least two weeks. You can freeze it too. NOTE: This year’s batter was so full of ingredients that I made a small third loaf, baking it for only 45 additional minutes once I had uncovered the cakes. Im glad you feel ready to make this lovely cake again, Liz. 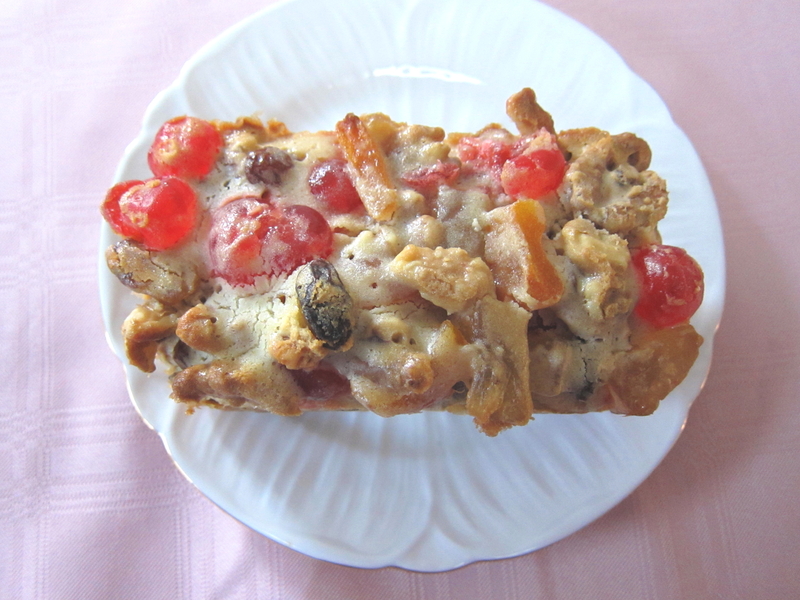 It definitely looks worth making- I have never seen a fruitcake so bursting with fruit! Thanks, Jayne, love that fruitcake is eaten all year long in the UK – Happy Christmas! I’m in! I share the same genes and cannot resist some version of fruitcake each year. I will happily try your recipe! No wonder we fruitcake buddies get along – hope you try it! Wow, this recipe makes me want to dive into fruitcake making. Great recipe. Thanks for sharing. Thanks, the recipe truly “works” – happy holidays! I hope you’ll all still like me after this confession, but I must admit I haven’t been drawn to fruitcake. But nothing I’ve tried looks even remotely as wonderful as yours. It’s just bursting with great looking fruits. I think I’ll make it for a holiday potluck I’ve got coming up! Thanks, Liz!! It’s always fun to have a recipe that brings back happy memories. The cake looks great 🙂 You and your mom did well!